If you told me there was a jerky snack made out of kelp - yes, like beef jerky - sure, I'd believe you. But if you told me that it was actually tasty - and hearty - well, I'd likely raise an eyebrow. A non-beef jerky that's satisfying, flavorful, and packed with nutrients and protein. But then I tried Akua Kelp Jerky and, no joke – I was actually floored. Not because I was expecting it to be horrible, but because I wasn’t expecting it to be quite so enjoyable. Akua is a new company on a mission to create a line of healthy, sustainable, kelp-based food. 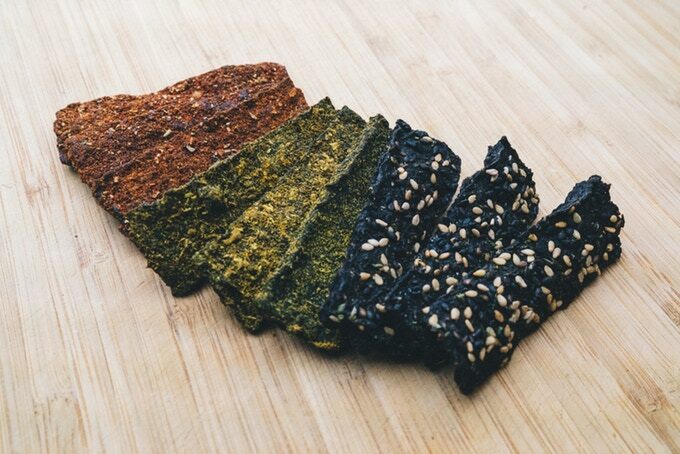 Their first product is kelp jerky, which comes in three flavors: sea salt and sesame, turmeric Thai and coconut, and rosemary maple and BBQ. Each 1.5 ounce bag of jerky (about nine strips) packs eight grams of protein and less than one gram of sugar (derived from maple trees, not the processed stuff), making it a healthier choice than most off-the-shelf energy bars. The jerky is made from 100 percent ocean-farmed, latissima kelp from Maine, along with shiitake mushrooms, pea protein, and chickpea flour, among other ingredients. Hi, I was browsing and happened upon this article which stirred my interest. I’m vegetarian and frugality enthusiast. If you are interested in product sales in Central Florida, I’d love to explore how we can both benefit. I was raised in South America. I remember when we used to make seamoss porridge and pour milk on top. Thanks.